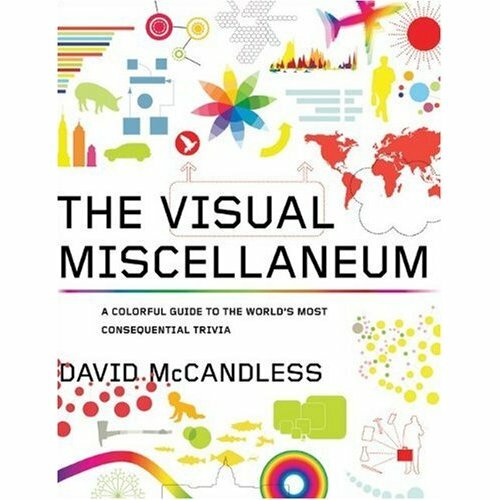 After watching David McCandless's TED talk "The beauty of data visualization" I was sufficiently curious to go ahead and buy his most recent book "The Visual Miscellaneum". As expected, it is a very easy to "read" book containing interesting and beautifully presented trivia. The main idea behind the talk (and I assume the book) is to present information in a visual way to make data more tangible. McCandless complains that the information that is given in the news is hard to grasp without context and shows, through his infographics, how it can be improved. He keeps a website where some of the visualizations are freely available and if you enjoy them and the talk then the book is worth a look too. What is interesting about these visualizations is that they occupy a space between art and data presentation. When I was going through the book I was considering if they could serve as a source of inspiration for research data. Is there room for more artistic visualizations in scientific articles ? Should we try to make data beautiful or does the primary objective of conveying the result totally overrides any artistic intention ? In a recent referee report a reviewer asked us to change some of the figures because he/she thought that there were redundant elements in them. The figure was not even about data but about the workflow of the project. This is not a complaint, just an example that probably illustrates well what is the current culture in academia. We are trained to be skeptical and constantly looking for tweaks or additions that obfuscate the results (i.e. weird scales, exploded pie charts). Maybe in our effort to be accurate we forget how important it is to make an image intuitive and pleasant.